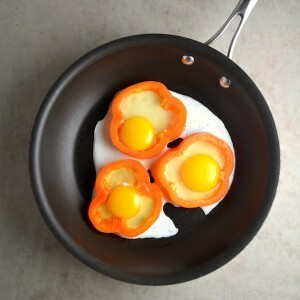 This recipe is a twist on the “egg-in-a-hole” or what I call “popeyes” recipe. And you may like the combination of egg, peppers, and parmesan even more than the standard egg and toast combo. The peppers add some pretty color and they seem a little fancy, even though they’re easy to make. Fried eggs and bell peppers are also a great breakfast if you’re trying to cut back on grains. And, hello, today is St. Paddy’s Day! And although I didn’t wear green, I ate eggs in a green bell pepper for breakfast. I also went to the dentist and had two cavities. What the? And I ate Thai food which I never eat anymore cause I live in a tiny town with no Thai people and very little culinary diversity. The Thai food was so good. I ordered green curry. Not on purpose. How ironic. Next St. Patrick’s day I’ll eat eggs in a green bell pepper again. And I’ll add a green smoothie and some sauteed kale to the meal. That sounds better than dying my eggs and milk green…I know, I’m such a party pooper. I like to use pastured eggs when I make these. Pastured eggs are from hens that are raised in a pasture setting and eat natural food like bugs and grass. Read more about the health benefits of pastured eggs here. I’ve been looking at chicken coops online, studying the different designs, and contemplating where to put one in our pasture. I’m going to get one this summer! Or maybe next. I’m way too methodical about these kinds of things. Whether this summer or next I’m looking forward to some fresh eggs from my own future pasture-raised chickens. Heat a pan over medium heat and add butter or oil to the pan. Cut the pepper into ½" rings and remove the seeds and centers. Place the rings in the pan and cook for about 1 minute. Flip the peppers and cook for another minute. 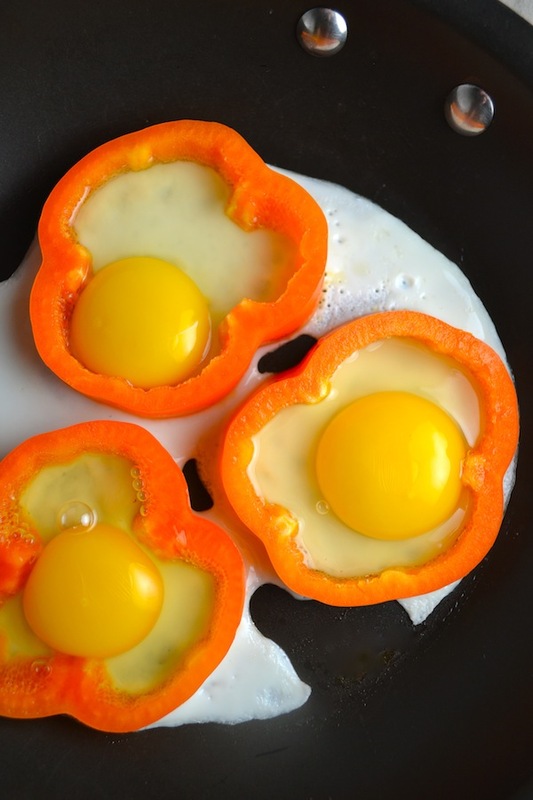 Crack one egg into the center of each pepper slice. To keep the egg from running under the pepper too much, pour the egg in slowly. Cook for 1 minute or until the egg has set and you can flip it without breaking the yolk. Flip each pepper and egg over carefully so the yolk doesn't break. Top with parmesan cheese and cook for another minute. 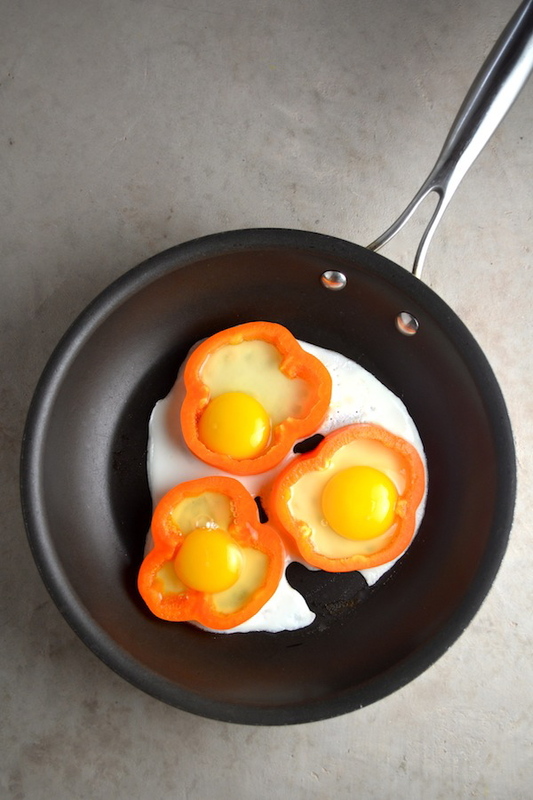 It's easier to cook just one or two "eggs in a pepper" in the pan at a time to make them easier to flip.